American Airlines began testing iPads yesterday in an effort to ditch paper navigational charts and save about $1.2 million a year in fuel, according to MarketWatch. Pilot flight bags typically weigh 35 pounds or more, and contain navigational charts and other important flight information. The tablets are being tested on two flights departing Los Angles for Tokyo and Shanghai, respectively. 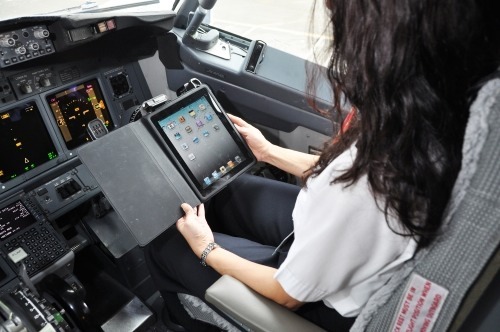 The Federal Aviation Administration has approved the iPad tables for all phases of flight, allowing for the first time the use of device during takeoff and landing. This announcement follows the news that Alaska Airlines would similarly issue iPads to its pilots. The 1 1/2-pound iPads replace up to 25 pounds of paper flight manuals that their pilots are required to carry when they fly. Alaska Airlines expects to have completed the switchover process by this month.